What about using a nearly closed area for condensing steam? This works better than the above open sheet method but is still not that practical in a primitive environment due to the need to carefully control steam flow, and the size of the cooling area needs to be large. Again too much flow easily overwhelms the surface area and will produce no or a small amount of distilled water. The heat from the fire producing hot air needs to be directed away from the condensing area. For this method one can use 10 foot galvanized steel roof rain down tubes, air-conditioning duct piping without insulation, or sheet metal vent pipes. The tests with this scheme were done using only one section of aluminum 3 vent flexible pipe 7 ft long. The open upper end needs to be nearly closed off so that it limits the steam flow. When properly adjusted, I was able to get 1 cup of water every 1.5 hour using this 3 by 7-foot method. If one had enough of these pipes and a way of directing the steam flow into each then one could produce sufficient water for drinking. One advantage of is this method is it can be made to limit the contaminants in the air from entering into the distilled output. Speculating now, if one had the space to do it, probably outdoors; one could build a porcupine looking half circle made out of 5-10 rain down spouts. One would take a bunch of these 8-10 foot rectangular tubes made out of galvanized steel, and join the open end (down ward direction) in a hemisphere shape. The upper closed end would have a small hole that could be adjusted by partly closing it off to maximize water output. I am thinking the ones that are nearly vertical would work best with a small air escape hole, and the ones that are more diagonal would work best with a slightly bigger hole. The water would collect on the inside as the outside cools off. As the water runs down the pipe and gets close to the end there could be smaller catching tubing that could be positioned to allow the water to run off into a collection point. The fire would be built off to one side and the steam diverted by use of air ducting into this hemisphere. Heat from the fire would be directed away from entering the tubes. Another idea: I bet one could take 2 garbage cans or two 55 gallon tanks or any 2 large metal containers and make a water distillation unit. Visualize two garbage cans lying horizontally on something that blocks it about 4 or 5 ft off the ground. Set the bottoms facing each other and flush with each other. In the center off to one side (not under the cans) visualize a fire built with water in a pan above it. 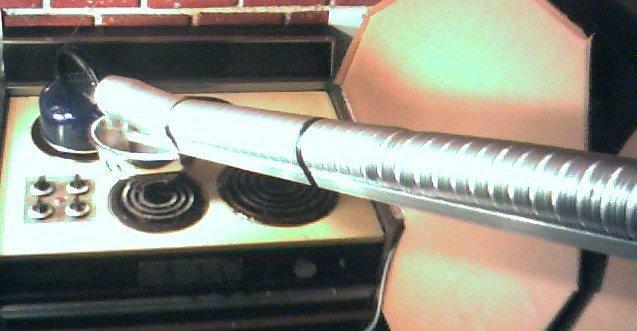 Run an air ducting vent pipe from over the boiling water to divert the steam into a cut hole in each can. This would be big enough to allow the steam to enter near the bottom of each can (right over the steam). The cans have their lids in place and taped shut. A small hole (let the air out) may be needed in the lid to tune it up to producing maximum distilled output water. Because of the tapered shape of a garbage can the water would run toward the lid of the can and out into a small catching container. All of the above methods use air to take away enough heat to allow the steam to condense as water this takes a lot of surface area if no movement of the air is present. It would be much more efficient to use a fan on the outside of the cooling surface. However, in a primitive environment this will not be likely due to then need for electrical power, thus I did not do any testing in this direction. If one had available a car radiator or car heater unit turned diagonal and allowed steam into the top in a slow controlled way so that no steam came out the bottom then one could collect the distilled water as it ran out the bottom. This would take some cleaning and purging of used radiators to get all the foreign chemicals out.